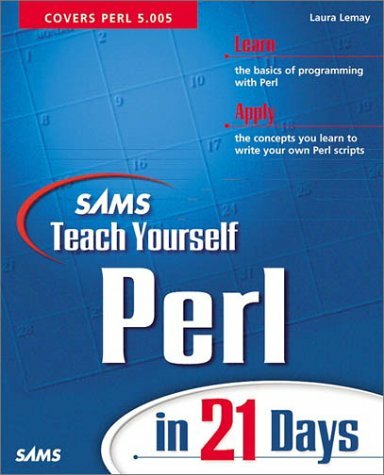 Amazon.com description: Product Description: Sams Teach Yourself Perl in 21 Days covers the basics of Perl in the first few chapters, and then moves on to practical issues of Perl and in-depth discussions of more advanced topics. Later chapters also delve into software engineering topics, with discussions of modular code and object-oriented programming. CGI is covered in one chapter, but it is not the focus on the book. The book relies heavily on longer working examples and code, as opposed to small snippets and code fragments, and each chapter includes two to three smaller complete examples and one major one that illustrates most of the concepts for that chapter and builds on the chapters before it. Written by Laura Lemay, this is her third major book after Sams Teach Yourself Web Publishing with HTML in 21 Days and Sams Teach Yourself Java in 21 Days. About: For use within the Cisco Networking Academy Program, Smester 6 study. About: A tutorial of a popular programming language allows beginners to learn the basic concepts and techniques of the language and then apply them in real-world programs through complete code examples built from the concepts of each preceding chapter.